College Sports Madness started their 2018 ranking of the top 44 Women's teams this past week. Catching everyone up. As usual, they have a little synopsis of each team; who left, who returned, who is. E.
Are they throwing names against a wall and seeing if they stick? Well, once you get out of Top 20, really it's a guessing game anyway. if anything, they tend to be "optimistic" regarding teams like OSU and McGuffs ability to mesh a bunch of newcomers together. I imagine their top 20 list will look like the ones put out by everyone else. Gophers enter the list at #26! It looks like the Big 10 will have 7 teams in their top 44, assuming Maryland and Iowa are in their top 25. That may a little high, but with no dominant team that would make for a very interesting conference race. Might see Michigan State as well. Both Michigan schools are always overrated. They have all these top 100 recruits and they don't maximize their potential at all. In regards to this poll, Michigan State hasn't even been listed for the last two seasons and is doubtful to be this season. Michigan's been listed three times in the history of this poll. My apologies. Overrated was the wrong word. I should say they underachieve or are poorely coached. The amount of talent that comes to both of th9se schools, they should be regulars in not just the NCAA tournament, but should win a game or two in 5he tournament regualrly, but they don't. Why isn’t NoDakSt updating this thread? 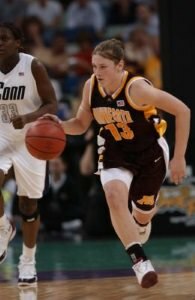 Gophers will be very good this year, they return a lot of firepower. Interesting that there are 4 SEC teams in a row and with Tennessee to come. Given that they are already probably over-ranked as a top 10 team, they might be listed as 10th, making it 5 SEC teams in a row. If this prediction is accurate, that will be quite a battle at the top with 5 teams equally matched. My money is on Miss. St. though. I would be pretty surprised if Tenn won the SEC. Not that they don't have enough talent, but just that they seem to underachieve year after year. Their preseason rankings have been way too high at least 8 of the last 10 years. Same for the SEC as a whole. But these publications are more interested in giving their readership something to look forward to than in astute analysis. The southeast is still a hotbed of women's basketball. Interesting that there are 4 SEC teams in a row and with Tennessee to come. Given that they are already probably over-ranked as a top 10 team, they might be listed as 10th, making it 5 SEC teams in a row. If this prediction is accurate. . . .
What did they do, draw names from a hat? How many people who actually follow WCBB believe (1) Miss St belongs outside the top 10, and (2) Missouri, UGA and Iowa belong in the top 15? Texas could be a sleeper. I'd probably put them a little higher, but Atkins was clearly very, very important. The addition of Williams is interesting but she's not Atlkins. If either of the two highly rated posts contribute right away, that should make them a formidable post rotation. I find them quite interesting, along the lines of Oregon State, who I think will also surprise some people though obviously they're coming up here in the top nine. Texas always seems to have talent. They play harem scarem (not the music group), and always seem to be a bit bball 'dumb'...so I guess that's on the coach, or maybe the kind of athletes she recruits. Missouri seems to have a nice freshman in Akira Levy. Levy started in a recent exhibition and played much of the game alongside Missouri veterans Cunningham, Lauren Aldridge and Amber Smith. She tied with Troup for second on the team in minutes played and tallied 10 points, six assists, six rebounds and three steals. She then had reality check with 4 turnovers in the third quarter.... possibly trying to do too much? A lot of those players were recruited by coaches who typically take smart disciplined players, so I place it 99% on the coach. I think Aston has taken over from McCallie as the leader of the "gets the least from the most" gang. The starting 5 would probably include Aston, McCallie, Close, Warlick, and Gustafson.